Rita Carter is a medical writer, contributing to, among others, the Independent, New Scientist, Daily Mail and Telegraph. She was twice awarded the Medical Journalists’ Association prize for outstanding contribution to medical journalism. Rita was on the panel of The Great Debate: Evolution, Human Nature and Autonomy in March 2001, The Great Debate: Whatever Happened to the Subject? in March 2004 and the Battle of Ideas Great Debate The Rise and Rise of Evolutionary Psychology with Caspar Hewett in October 2005. I believe we are determined because humans are part of the natural universe and (as far as we know) the natural universe is entirely governed by the laws of cause and effect. I see no reason why we should regard ourselves as somehow outside that framework  nor have I heard a convincing argument as to how we COULD be outside it. I therefore believe freewill is an illusion. The reason it is so utterly convincing is that the illusion  like the illusion that the objects around us are solid, or have some integral color  is deeply wired into the brain as a set of mechanisms which automatically create the sense of self/ subjectivity and agency that makes it feel as though we decide what our acts will be rather than merely respond to stimuli. There is, I believe, evidence to show that this is the case: e.g. Libet’s famous experiment showing that the brain begins an action before consciousness of it emerges. Neuroscience is also unravelling the mechanism of self and agency and these are now charted well enough for them to be copied in AI systems. These “self-sensing” robots will, I believe, develop the same sense of agency and subjectivity that Kenan Malik claims is unique to mankind and distinguishes us from machines. Today a brain scan reveals our thoughts, moods, and memories as clearly as an X-ray reveals our bones. We can actually observe a person’s brain registering a joke or experiencing a painful memory. Drawing on the latest imaging technology and the expertise of distinguished scientists, Rita explores the geography of the human brain. Her writing is clear, accessible, witty, and Mapping the Mind’s 150 illustrations  most in color  present an illustrated guide to that wondrous, coconut-sized, wrinkled gray mass we carry inside our heads. 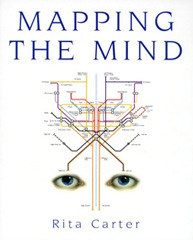 Mapping the Mind charts the way human behavior and culture have been molded by the landscape of the brain. Rita shows how our personalities reflect the biological mechanisms underlying thought and emotion and how behavioral eccentricities may be traced to abnormalities in an individual brain. Obsessions and compulsions seem to be caused by a stuck neural switch in a region that monitors the environment for danger. Addictions stem from dysfunction in the brain’s reward system. Even the sense of religious experience has been linked to activity in a certain brain region. The differences between men and women’s brains, the question of a “gay brain”, and conditions such as dyslexia, autism, and mania are also explored. 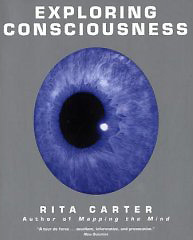 In Exploring Consciousness, Rita ponders the nature, origins, and purpose of consciousness in this fascinating inquiry into the toughest problem facing modern science and philosophy. Building on the foundation of her bestselling book Mapping the Mind, she considers whether consciousness is merely an illusion, a by-product of our brain’s workings, some as yet inexplicable feature or property of the material universe or  as the latest physics may suggest  the very fundament of reality. Little, she discovers, is as it first seems. She draws from a solid body of knowledge  empirical findings and theoretical hypotheses  about consciousness, much of it derived from recent discoveries about the brain. Her lively, accessible narrative ranges widely over new ways of thinking about the subject and what direction new research is taking. Leading scholars from a range of perspectives provide topical essays that complement her account. The book also discusses how traditional approaches  philosophical, scientific, and experiential  might be brought together to create a more complete understanding of consciousness. What is known about the workings of the human brain has increased immeasurably in recent times. Drawing on the latest discoveries, Mapping the Memory: Understanding Your Brain to Improve Your Memory offers readers a unique scientific approach to improve their memory. 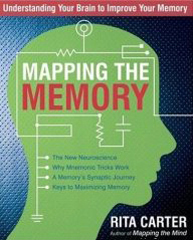 Presenting a wealth of information in a highly accessible format, Mapping the Memory explains the different types of memory: episodic (what happened), semantic (facts), procedural (how to do things), and working (everyday routines). It then details which parts of the brain govern memory and how memory loss can be controlled. Self-assessment questionnaires, memory exercises, case studies, therapies, tips, and tricks are all included to help readers reach a higher level of understanding about memory and how they can improve the working of their own brain function in this area. 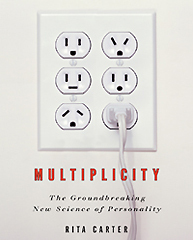 Multiplicity: The New Science of Personality, Identity, and the Self presents an entirely new view of our selves. Instead of seeing each person as a single personality, Rita argues that we all consist of multiple characters, each one with its own viewpoint, emotions and ambitions. The mother who feeds breakfast to her children, for example, has quite different concerns and opinions from the woman taking part in a boardroom discussion two hours later, and from the woman she will be with her husband that night. Yet all three may share the same body, and none is any more “authentic” than another. Personality changes in a person are conventionally frowned upon, but Rita shows that in today’s world our ability to switch from one personality to another according to what is demanded of us is a huge strength, providing one’s personalities work together as a team rather than against each other. In addition to its groundbreaking scientific thesis, Multiplicity contains extensive exercises designed to help readers achieve this harmony. Rita also authored the articles The moral brain, Phineas Gage and the flying tamping iron, “I’ve been here before…”, Gorilla blindness: so you think you can see?, Fractured minds, and Tune in and turn off: autistic savants. Read the interview Mapping the Mind with Rita Carter. Go to her web page.